← Fat people are hungry – The Science! In my post, Top 10 Tips for Winning the Hunger Games, I wrote about the strategies that work for me in managing hunger. This was a brief overview and probably too much for one post, so I thought I would write a series of posts going to each “tip” in greater detail. Let’s start the series where I start my day, with breakfast! If you identify with my description of “unnatural zombie hunger” and want to do something about it, just start eating breakfast if you do nothing else. Yes, your annoying mother was annoyingly right when she told you that “breakfast is the most important meal of the day.” So if breakfast is the most important meal, I say it should also be the most delicious! When you wake up in the morning, how awesome would it be if your first thought were not that you need to check email, rush to get ready for work, sort out the kids but “what’s for breakfast?” Yum! I can already hear the excuses: “I am not hungry in the morning.” “I don’t have time.” Yeah, yeah, I know you people, because I was you people 🙂 Let me give you a clue: You are not hungry in the morning because you are hung over from your TV and snacking binge of the night before. What’s more, you can find time if you get organized and make a few minutes to throw something together before you rush off into your stressful day. The bottom line is if you don’t eat breakfast, plan to stay fat, hungry and miserable! I started my breakfast habit by drinking a meal replacement. Not ideal but better than nothing and it allowed me to gradually transition to smoothies and then to a full main meal. Start with whatever works for you and just have something every day and soon you will wonder how you ever got by without it! Fruit: I choose berries for anti-oxidants and deliciousness! I get a month’s supply from Hillcrest Berry Orchards. They have a great variety and their quality is out of this world! I then divide the berries into 100 gram portions in Ziploc bags and keep them in the freezer. I normally indulge in 200 grams of 2 or 3 kinds a day. This special treat alone is enough to keep me showing up for breakfast every morning without fail! Protein: My go-to choices are eggs, whey powder or Greek yoghurt. Healthy fat: Favorites are nuts or a bit of Coconut Oil. Fiber: Chia seeds are the perfect choice because they keep you full for hours and can be eaten on their own or added to just about anything. Whole grain. If I am having grain on any given day I make sure at least one of the portions is for breakfast. My new discovery and current favorite is puffed amaranth, but also love whole oats. I love this breakfast because besides being so decadent that it should be illegal, it allowed me to make creative use of the interesting ingredients I have been collecting from The Ethical Co-Op and local Farmers Markets. I have Ashley of Edible Perspectives to thank for the fantastic amaranth recipe (she calls hers French Toast but mine came out more like flapjacks because I made the batter a bit wetter.) Between the flapjack and ice cream layers are blue berries, black berries, raspberries, brazil nuts and pecan nuts. Sigh. . . This would be a great time to introduce my new recipe page. 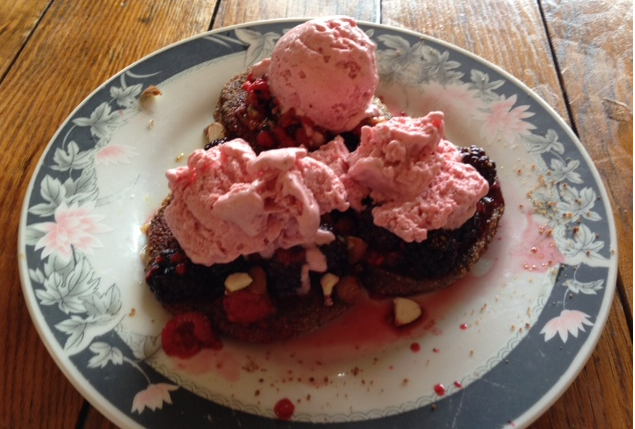 Swing by to get the ice cream recipe for this breakfast and see Edible Perspectives for the Amaranth French Toast recipe. Hope you like it and that it inspires you to begin your own Breakfast Adventure! This entry was posted in Hunger Game Tips and tagged amaranth, berries, breakfast, Chia, Coconut Oil, Cook, fiber, fruit, Greek yoghurt, healthy fat, Home, homemade ice cream, Meal replacement, nutrition, oats, protein, whole grain. Bookmark the permalink.